Rubber sole, indoor / outdoor. Slip Resistant. Multi- density cushioning system, maximum comfort. Machine washable. Heather gray with faux fur trim. Pink with gray lining. Low back, slip on, scuffs style. Soft cloth, cushioned insole, rubber soles for indoor / outdoor, machine washable. Rubber sole, indoor / outdoor. Slip Resistant. Multi- density cushioning system, maximum comfort. Machine washable. Material: synthetic / man made materials. The size is a woman's large or 9/10. Knit and woven fabric upper in a scuff slide slipper style with an open toe. Plaid detailing. Slide entry. Comfy Soft lining, cushioning Soft footbed. Textured outsole. Features: Gray faux fur, sequin accents, open back, slip on slippers. Quilted terry microfiber insole. Super plush house shoe. Based out of North Dakota. We will get back to you right away. 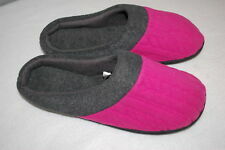 Dearfoams S Small Quilted Velour Upper Clog Slipper. Hard sole cushioned slippers. Small is shoe size 5 to 6. Machine washable. Multi Density cushioning system. 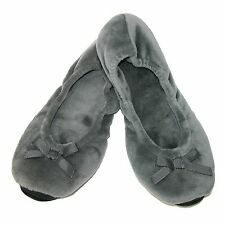 You will receive ONE brand new pair of Dearfoams Closed toe Women's size 9-10 size Large Solid Gray colored plush slippers. They are lined through out interior of footwear.the material for exterio is soft & fluffy. These will be oh soooo comfy!!! They have that comfortable memory foam also and are machine washable. They are considered indoor/outdoor footwear. Please contact me prior to purchase with any question or concerns. Cancellations can not be processed. I ship Monday through Friday. Payment due at time of purchase through PayPal. Only Returns excepted at Buyers expense if shipment has not been opened. They are considered indoor/outdoor footwear. (MACHINE WASH COLD). COLOR: GRAY. Open back, slip on, machine washable, indoor / outdoor, rubber soles. >>> CHOOSE YOUR COLOR <<<. 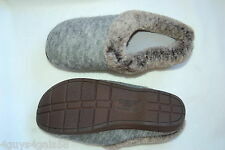 Size 7-8, New Condition w/ Tag, Very Soft, Slip Resistant Sole, Thick Padded Insole, Faux Fur Lined. Rubber sole, indoor / outdoor. Slip Resistant. Multi- density cushioning system, maximum comfort. Machine washable. Heather gray with faux fur trim. Size : Small 5-6. DEARFOAMS Slip on House Slippers. Size: Small (5-6). Hrs 9:00 am to 5:00 pm M-F. Style: Ballerina Ballet Flats House Slippers. Color: Gray Grey. 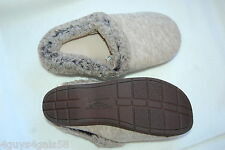 Features: Slip On, Fuzzy Fleecy Soft Materials. USA Size: Small 5-6. Color:Sleet Grey. Sleet Grey. Proof is in the cushioning - The comfy slippers you just settled into are the result of careful consideration. We use multiple layers of foamto cushion like no other. Give us a shot and we will make sure that you will look to us again! Color:Sleet Grey. Sleet Grey. Proof is in the cushioning - The comfy slippers you just settled into are the result of careful consideration. We use multiple layers of foamto cushion like no other. Size:Large / 9-10 B(M) US. Slippers don't get any cozier than these Sweater Knit Closed Toe Scuffs by Dearfoams. Featuring a textured lounge knit upper and a plush pile cuff and lining, these women's slippers have a multi-density memory foam insole for unsurpassed comfort. The durable TPR outsole is skid resistant for safe wear indoors and outdoors. * Textured lounge knit with plush pile cuff and lining* Multi-density memory foam insole* Indoor/outdoor TPR outsole* Imported* Machine wash and dry flat* Sizes: S (5-6), M (7-8), L (9-10), XL (11-12). Walk with classic comfort in the Dearfoams Textured Knit Clog slippers which feature faux wool lining and a wooden button detail. Faux wool lining. 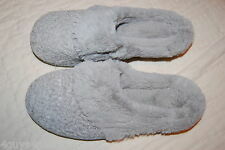 DEARFOAMS SMALL GRAY #990/990-A/990-B/990-C/990-D. FLEECE GIVES THIS SLIPPER CLOUD-LIKE SOFTNESS/LIGHT PADDING TO. CRADLE/COMFORT AND GREAT STYLE/QUILTED COLLAR/ROUNDED TOE. SIZE SMALL 5-6 GRAY STYLE 60107. You can wear these in or outdoors. Perfect as they. Sole: 100% Thermoplastic-Rubber Machine Wash Cold Water. Shoe Lining Material: Polyester. Large 9-10. Upper Outer Surface: 100% Acrylic.